A view of the free-flowing section of Columbia River. Some of the older nuclear waste storage tanks at Hanford. Nuclear reactors line the riverbank at the Hanford Site along the Columbia River in January 1960. 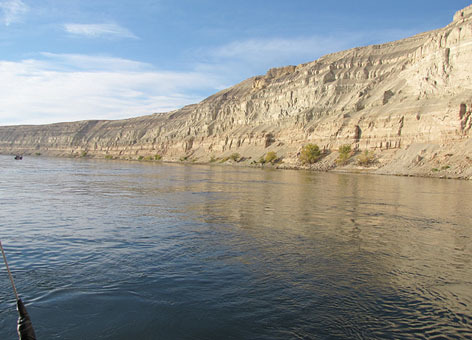 Blog: What Are Our Options for Restoring Lands Around Washington’s Hanford Nuclear Reservation? Blog: What Do Hanford’s Latest Nuclear Waste Leaks Mean for Environmental Restoration? Blog: Restoration Amid Nuclear Waste and the Largest Environmental Cleanup in the U.S. The Hanford Nuclear Site is located in eastern Washington State, and encompasses more than 500 square miles of land. For nearly 30 years, The U.S. Department of Defense and the Department of Energy produced tons of plutonium for use in the atomic weapon program. Activities at Hanford produced significant quantities of waste containing hazardous chemicals and radioactive materials. Some of these contaminants leaked into the land and water, including into the Columbia River. Public use: Non-commercial recreational activities and other services provided in the area may have been affected by operations or contamination at the site. Tribal use: Tribal services may have been diminished in quality, or interrupted, by site operations and discharged contaminants. NOAA and our partners are currently in the initial assessment phase. We have identified a variety of cultural, economic, and scientific studies that will help identify and quantify injuries at Hanford. Once we understand the injuries we will be able to determine the type and amount of restoration required to offset those injuries.